Tronies – studies of heads – constitute a separate category of portraiture because they depict anonymous models. These bust-length portrayals were not intended as likenesses of specific people but as studies of facial expressions or characterizations of certain figure types. Sometimes the artist took his own face as an example, Rembrandt often did this. 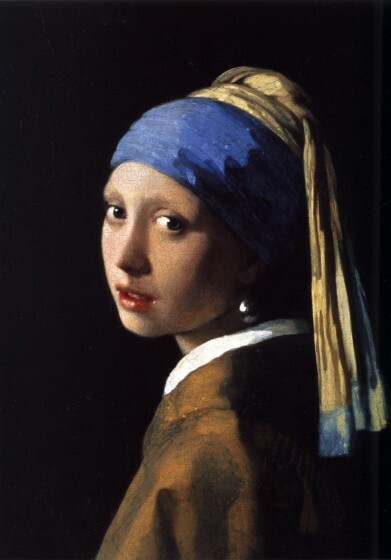 The most famous Dutch tronie is undoubtedly Vermeer’s Girl with a Pearl Earring. I have been making tronies, more often than not taking my own face as an example, for years and didn’t even know it! This was an ah-hah moment! Yes, I’ve printed a few portrait monotypes; I’ve printed dozens of tronie monotypes and will continue to do so. One more note: I stood and lingered before Girl with a Pearl Earring, a painting I’ve loved dearly for decades, four different times during the course of our visit to the exhibit at the de Young last Saturday. This was An Ahhh Moment. It felt as if I’d been corresponding with Girl for years and now, finally, we stood before each other in person and had an opportunity to meet, literally, face-to-face. Sweet.